Dr. Schlosser provides patients with a way to improve their dental experience through minimal oral conscious sedation. 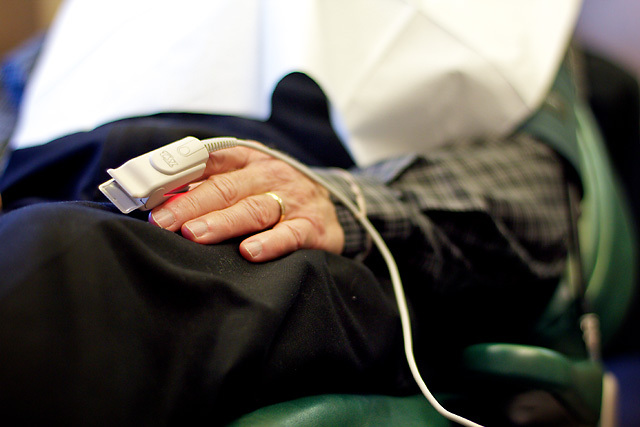 With this treatment aid, anxious patients feel more at-ease, allowing them to receive the care they need and may have previously avoided. This form of anxiety reduction becomes especially beneficial during complex procedures, by creating the illusion that your dental appointment has passed quickly, and promoting a relaxed and comfortable treatment experience. Our Springfield dentist is committed to treating patients with compassion and providing solutions for positive dental experiences. He and his team routinely care for patients who appreciate this tool. Minimal Sedation dentistry is often mistakenly thought to induce sleep. In fact, the oral sedatives allow the patient to stay awake but remain so relaxed that they may find it easy to doze off during their appointment. Before prescribing this form of assistance, Dr. Schlosser consults with patients to discuss medical history and determine if this treatment will meet their needs while ensuring procedure safety. Minimal Sedation is popular because it does not involve IV needles, anxiety or pain. Although awake and able to respond to simple commands, most patients report little or no memory of their treatment experience. Our patients who benefit from this care should plan for a friend or family member to drive them to and from their appointment. Please contact our office to see if Minimal Sedation may be appropriate for you. We will gladly discuss your needs in an understanding way.